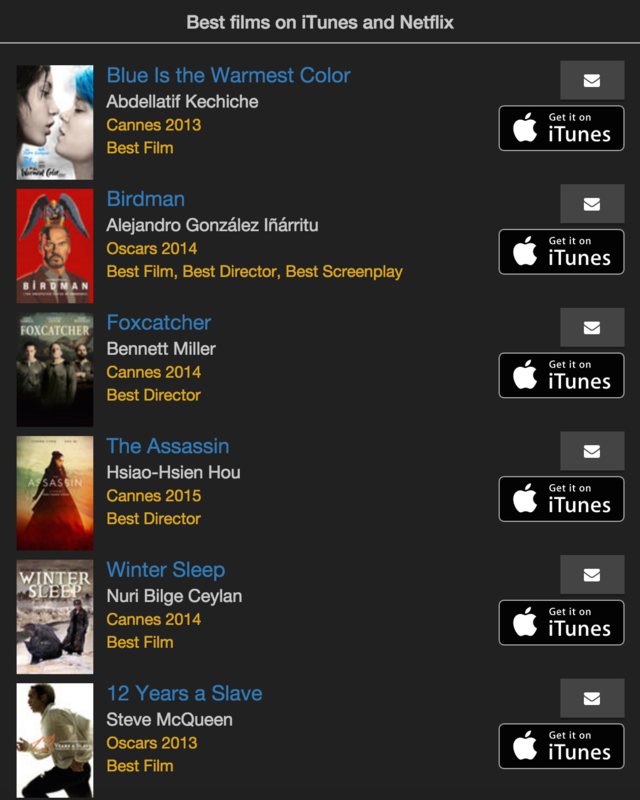 Filmster finds the best movies on iTunes and Netflix, based on their selection by international film festivals and award ceremonies. Cinephiles' beloved app Filmster announces the launch of FilmsterOnline.com. Movies available on iTunes and Netflix are listed according to the awards that they won at top film competitions: Cannes Film Festival, Venice, Berlin, Toronto, Sundance, The Oscars, Césars Awards. Novelties include polls of the Greatest Movies of All Time by the magazine Sight & Sound, and TV series nominated for Emmy Awards. Finding a good film on iTunes or Netflix can turn into an ordeal for true movie-lovers. Standard search options focus on popularity rather than quality, which often disagree. Filmster's philosophy is to offer new ways of finding the most interesting films available on iTunes and Netflix. Main search criteria are film competitions and award categories. Filmster can for example find films that won Best Director awards at the Cannes or Venice Film Festival. There are also annual top 10 lists by French magazine Cahiers du Cinéma, All Time lists by Sight & Sound, and favorite films of famous directors (Coppola, Kubrick, Scorsese, Tarantino, and more). It has never been easier to find a great movie to watch.